"Katie Couric’s mother was an abortion activist for years and years. She does not like to point that out, but she goes out of her way to take up the cause. "This morning on her syndicated radio “notebook”, Katie mourned the loss of George Tiller. She went through all the abortionists killed over the years. She implied that this was typical of “abortion opponents” and so many abortionists live in fear. "Like Barack Obama, Katie has not used her notebook to talk about the islamofascist “peace activist” who gunned down American soldiers in Arkansas in an act of terror on Monday. "Why? Because Katie can score points against the pro-life movement with the Tiller murder, but she undermines her own cause — opposition to the War on Terror — by talking about what happened in Arkansas." That article is from RedState. "I feel sorrow for the Tiller family. I respect the sanctity of life and the tragedy that took place today in Kansas clearly violates respect for life. "Regardless of my strong objection to Dr. Tiller's abortion practices, violence is never an answer in advancing the pro-life message." Evil peole, those pro-lifers; they must be stopped! "The stories of two very different lives with similar fates crossed through the media's hands yesterday - both equally important but one lacked the proper attention. "The death of 67-year old George Tiller was unacceptable, but equally disgusting was another death that police believe was politically and religiously motivated as well. William Long died yesterday. "The 23-year old Army Recruiter was gunned down by a fanatic; another fellow soldier was wounded in the ambush. The soldiers had just completed their basic training and were talking to potential recruits, just as my son, Track, once did. "Whatever titles we give these murderers, both deserve our attention. Violence like that is no way to solve a political dispute nor a religious one. And the fanatics on all sides do great disservice when they confuse dissention with rage and death." Murder is murder, and the assassination of George Tiller is inexcusable, and with the Gov, I feel sorrow for him and for his family. But I feel more sorrow for the tens of millions who have had their skulls crushed and their brains sucked out while still in their mother's womb. I feel more sorrow for the millions of children (mostly black and minorities) who have never been given the same chance to live that their parents had. I feel more sorrow for the millions of babies with special needs whose precious lights were blown out before they had a chance to shine. I feel more sorrow for the twisted mind of a journalist, whose priorities tell her to weep more over the death of a baby-killer, than to feel any emotion for the little children who died at his hand. I feel more sorrow for my country, a land whose greatness was once tainted by the blood and sweat of slaves, and is now tainted by the cries of dying innocents, who cannot yet speak for themselves. 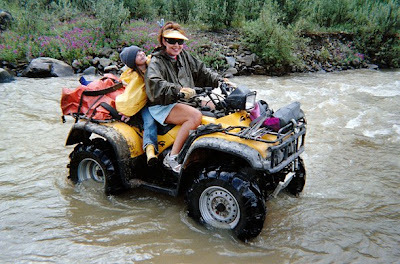 That save the trees and kill the children....."
Sarah and Piper ATV'n it! Michael Reagan was in Alaska this week. 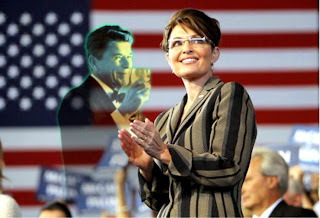 He gave a speech in Anchorage on what Ronald Reagan would do today. Governor Palin introduced him, and it was a bang-up introduction. She chewed the policies of the current administration up and spit them out! "I've been trying to convince my fellow conservatives that they have been wasting their time in a fruitless quest for a new Ronald Reagan to emerge and lead our party and our nation. I insisted that we'd never see his like again because he was one of a kind. This was Ronald Reagan at his best — the same Ronald Reagan who made the address known now solely as “The Speech," which during the Goldwater campaign set the tone and the agenda for the rebirth of the traditional conservative movement that later sent him to the White House for eight years and revived the moribund GOP. Last night was an extraordinary event. Widely seen beforehand as a make-or-break effort — either an opportunity for Sarah Palin to show that she was the happy warrior that John McCain assured us she was, or a disaster that would dash McCain's presidential hopes and send her back to Alaska, sadder but wiser. Much has been made of the fact that she is a woman. What we saw last night, however, was something much more than a just a woman accomplishing something no Republican woman has ever achieved. What we saw was a red-blooded American with that rare, God-given ability to rally her dispirited fellow Republicans and take up the daunting task of leading them — and all her fellow Americans — on a pilgrimage to that shining city on the hill my father envisioned as our nation's real destination. Welcome back, Dad, even if you're wearing a dress and bearing children this time around."